So, you've been assigned the task to buy an induction heating system for heat treating: It's an intimidating, but by no means impossible, assignment. With the help of the information in this article, you could be able to develop common ground with your supplier and have the tools to work with him or her to get the right machine for your jobs. 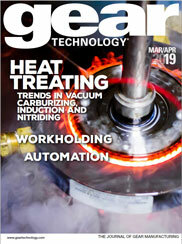 Gear Technology's directory of heat treating suppliers for the gear industry. Happy days are here again, says the old song, and given the current economic numbers, one can scarcely argue. Productivity is up; unemployment is down; inflation is practically nonexistent; the budget deficit is shrinking fast. Jules Kish responds to comments about his article on finding a hunting ratio, and Dr. Sante Basili argues that shaving is still the best way to finish a rough-cut gear. Complete Technical Calendar for March/April 1998. Heat treating is a critical operation in gear manufacturing. It can make or break the quality of your final product. Yet it is one that frequently gear manufacturers outsource to someone else. Then the crucial question becomes, how do you know you're getting the right heat treater? How can you guarantee your end product when you have turned over this important process to someone else? Industry News for March/April 1998. In our never-ending quest to bring our readers information about he unusual, the unique and-dare we say it?-the bizarre, the Addendum Staff has traveled for this issue to the wilds of Darkest Tennessee and the Museum of Appalachia. This museum of Appalachian fold art, crafts and history is located in Norris, TN, about 16 miles north of Knoxville. Among the 250,000 items collected by the museum's founder, John Rice Irwin, is a "thing," a "contraption," an "objet trouve"; to wit, Asa Jackson's mysterious machine.